The former University of Oregon coach and first basketball player I ever looked up to is now in charge of Kidsports. Coolio. Good for her. Maybe she won't destroy them, like she did Oregon. What a terrible job of coaching. Fact. Bev Smith was FIRED at Oregon. Opinion: She is a terrible coach. Here's a second one. I'm a friend of one of Bev Smith's players and I can state without question that the woman has serious problems dealing with African American girls. The girls went several times to the AD complaining about preferential treatment given to the white players. It might not have been the primary reason she was fired, but it certainly played a part. And on a statistical note, her record at OU was not a whole lot better, and in some cases worse, than those three coaches you noted earlier were "bad". One might add Bev Smith to that illustrious list. What about black coaches who have do not deal well with white players? Tia Jackson at UW, ring a bell? Wow, these are some serious allegations. I don't know what to say. As a Pac-10 follower, the complaints of race bias against Bev Smith are old stuff. I think you can ask the various editors of the online services you work for and they'll tell you the first hand stories. 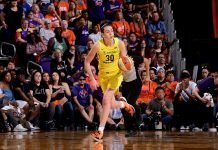 As for Tia Jackson, her reputation at UW is definitely different than at UCLA where she was considered the glue that held together a fractured team, and that included white players like Lindsey Pluimer. In her defense, I don't think that Bev Smith was racist or malicious in the least but really just didn't understand the differences and similarities and tried to overcompenate. The problem is that if you're a coach of something like womens basketball, if you can't relate to the players who are the predominent race on your team, you're going to have big trouble. Her problems became so well known that it's believed that it helped usher in the era of the African American female head coach in the Pac-10 because ADs believed that coaches like Jackson, Nikki Caldwell, Niya Butts and LaVonda Wagner, who preceded the departure of Smith, could handle the situations better. End result is Jackson and Butts have not proven themselves as being communicators and Wagner and Caldwell have. And unfortunately, Bev Smith didn't either. Wait, let's be fair. Oregon has had huge issues getting black players. This was clearly shown in the early 90's book about Jody Runge and the Oregon program. It will only continue with Westhead and Dan Muscatell. Muscatell had a lily white team at Sac. St. If any coach wants to learn how to handle the changing of the complexsion of your team, look at Mark French at UCSB. He had a lily white team and worked very hard to change that. Did a damn good job, too. Sue, you call JB a bad coach but with your posts about Ben Smith, you consider Bev to be a good coach? JB is a much better coach than Bev, ever hoped to be. Is "JB" a reference to Jenny Boucek? If so, I don't recall ever saying Boucek was a bad coach. I always liked her a lot when she worked for the Storm. Whether or not she conducted religious discussions is a separate issue from her coaching. I never said Bev was a good coach, either. I said I enjoyed watching her play when I was a kid. Someone I've known for a LONG time, who has been a UofO season ticket holder for years and years, just emailed me. Said she hadn't heard the racial rumor. Thinks it was that Smith assumed team members would work on physical conditioning on their own, too, but they didn't. She's going to ask around Eugene about the racial allegations and get back to me. She will know who to ask in the community to find out the dealio. Sorry JB is Joan Bonvicini. Sorry I thought I had posted the message on the Seattle U hiring thread. If you haven't read Full-Court Press: Season Life Winning Basketball Team Women Who Made it Happen. Buy it and read it. Cool, thanks for the recommendation. Always interested in a new book. I know I may come off strong but I do enjoy reading your blog and whether we agree or not, we both share a passion for WBB. I sure don't expect everyone to agree with me, and in fact, sometimes I learn from somebody else's side.